9 out of 10 Hebrews prefer Copperplate Gothic Bold. It’s not limited to an isolated local anomaly, it’s a National preference. 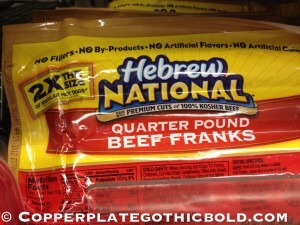 Hebrew National certifies that Copperplate Gothic Bold is good enough a(nd worthy enough) to be brandished on their packaging. Hebrew National not only has to answer to consumers in the marketplace (but as their advertising states) they answer to a higher power. So rather than be in “Nathan’s” “Ball Park” when it comes to delicious links of questionable meat (that all happens to taste the same regardless of what meat(s) it’s made of) go with your eye and what old Freddie Gaudy would have gone for, a heaping hunk of Copperplate!! !